This pairing makes a great gift for less than $20! 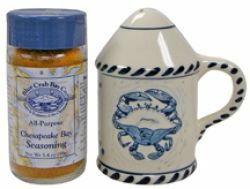 It features a Blue Crab Seasoning Shaker and Blue Crab Bay's Chesapeake Bay Seasoning to go right in it. The shaker is hand-painted from an original design by Eastern Shore artist Jos� Dovis. Shaker is dishwasher-safe. The Chesapeake Bay Seasoning, in a 3.4 oz. jar, is a culinary tradition of the region and a kitchen staple. Add to steamed crabs or shrimp, fried chicken, french fries, even popcorn!